I wasted days playing the 2008 edition. Michael Munday, of Somerset fame ended up taking over 1200 wickets at 21 for me. I very realistic simulation I feel. He still wasn’t deemed good enough to be picked for England, which was good. Michael Munday, leg spinner. Takes wickets for fun on that game. I ended up picking him for England when I got to be in charge of them. He got whacked all over the place by the Aussies so I dropped him. 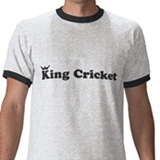 i have been playing ICC 09, and i have come to 2013 in wait of another edition where there will b IPL….